The Wall Paintings Workshop has been involved in conserving several interesting examples of 17th century wall painting, both in domestic end ecclesiastical settings. Domestic mural schemes survive in large stately homes such as that at Knole in Kent and in smaller settings, such as the private chapel at the St Martins Priory in Canterbury. The latter is of some interest as it provides an insight into the Priors private devotional worship. 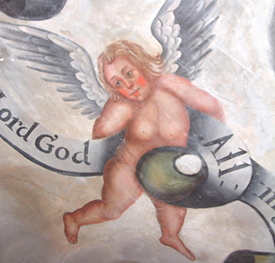 Large 17th century ecclesiastical schemes are rare and that at Bromfield in Shropshire, with its heavy-set, rosy-cheeked putti, is of particular note.